The South Carolina man, 51, was arrested Saturday morning for assault and battery. He is being held in the Horry County jail on lieu of $5000 bail. 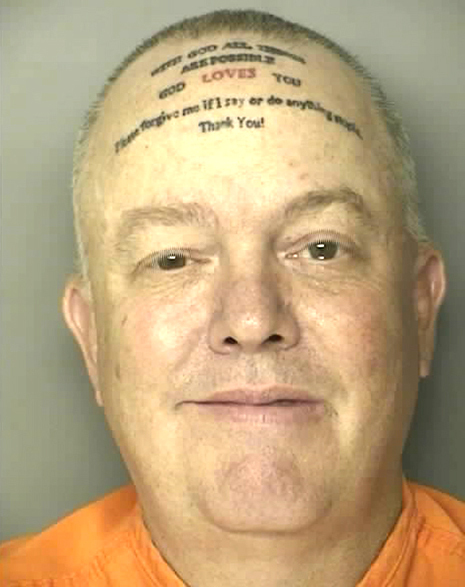 According to the suspect’s forehead, which quotes Matthew 19:26, “With God All Things Are Possible.” Noting that “God Loves You,” Kennedy’s melon also seeks forgiveness in the event he says or does anything stupid. Submitted by DeepSix on Wed, 2011-05-11 19:42. I gotta eyeball tatooed on the head of my p#nis. Great for tonsil inspections ! Submitted by robincradles on Tue, 2011-05-10 18:44.
wow I miss Rainbow wig dude.at the games. Submitted by desirefirst on Tue, 2011-05-10 13:57. Submitted by killshot71 on Wed, 2011-05-11 12:42. Now that's classy. I only have a tattoo on my buttocks that says "One way." Submitted by starspring on Mon, 2011-05-09 21:06. Its embarrassing to realize that as a person, this guy comes with a warning. Submitted by Frank Sumner on Tue, 2011-05-10 09:13. No no no- its great he warns the rest of us. Keeps us from wasting time on him! Keep it simple stupid!!! Submitted by Loveourvets on Tue, 2011-05-10 14:54. Could be that he's no fool. What a great way to get away with all kinds of things. People say, "Awww, he doesn't know any better, he's just crazy." Submitted by ahhgoosh on Mon, 2011-05-09 12:52.
wow. kinda sad to see how the Kennedys have fallen. Submitted by Frank Sumner on Tue, 2011-05-10 09:14. Submitted by Working Liberal on Mon, 2011-05-09 11:56. I'm not sure that's the best way to spead the word.